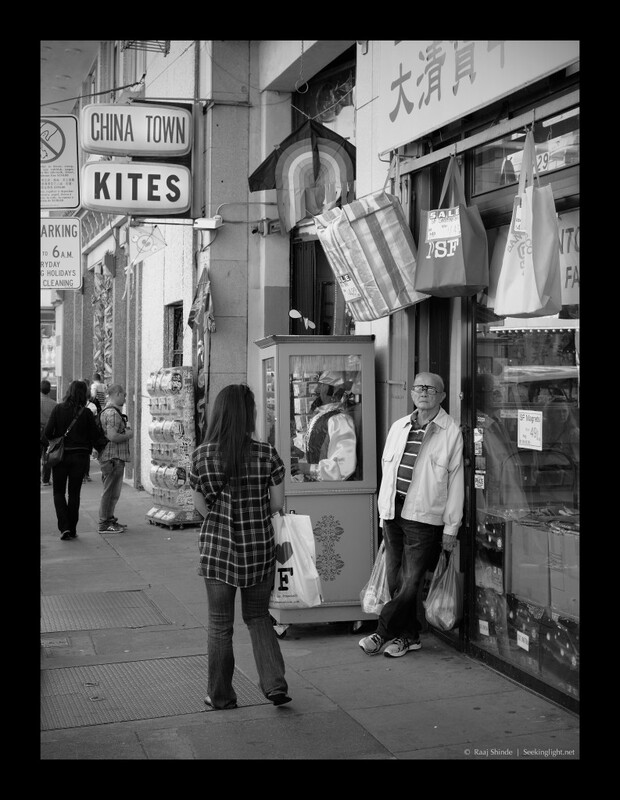 Recently, I had the opportunity to spend half a Saturday walking through San Francisco’s Chinatown, one of my all-time favorite places to walk-through, camera in hand. Usually, I shoot with a Rangefinder camera but of late I’ve been shooting almost exclusively with the Nikon Df and the 50mm Nikkor “Kit” lens. Much has been written about the “Rangefinder Experience” and the value of a Rangefinder for street shooting, some of which I even agree with! Whatever the benefits/disadvantages of a rangefinder camera for street photography, a relatively small, very high quality DSLR camera-and-lens combination like the Nikon Df + 50mm/1.8 Nikkor can certainly enable one to shoot effectively in the street. To me, street photography is a state of mind, an ability to blend into the street and boldly shoot. The camera hardly matters, as long as the camera inspires you to shoot. For me, the Df is a superb camera. I’m especially enamored of the monochrome images that I can coax out of the camera with little effort. Wow! Great image. Really conveys a sense of being there and participating in a moment in time. And, the processing is sublime.